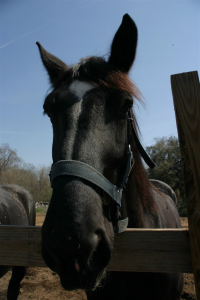 We currently have Belgians, Percherons and American Spotted draft horses in our stables. 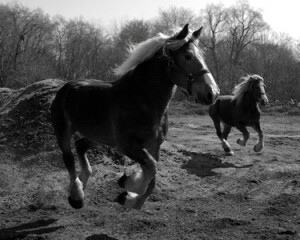 These magnificent animals are growing in popularity. 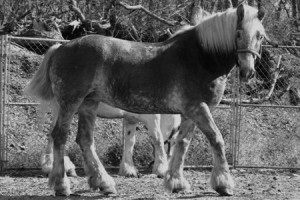 Because of their large size and muscular build (many weighing as much as a TON) they are typically used in farming and show hitch classes. 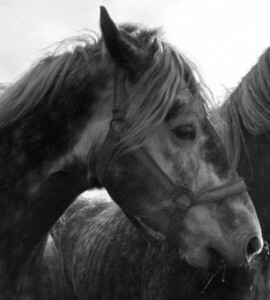 The secret is out about their very sweet personalities and gentle manners, as you will see these horses kept as personal riding horses more and more! 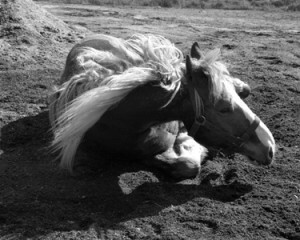 Just like humans, our horses have wonderful and distinct personalities. Their intelligence is shocking at times, so don’t venture too close if you are holding sweets! We invite you to take a few minutes and read about each one of our treasured CTOS (Carriage Tours of Savannah) co-workers. We feel you would really be missing out if you skip this page! 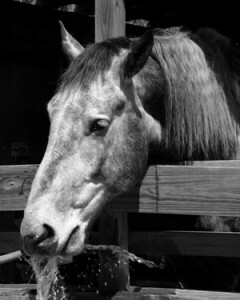 (Height: 18 hands; Color: Grey; Sign: Pisces) Billy is a tall, lanky Percheron, who likes long walks under the trees. 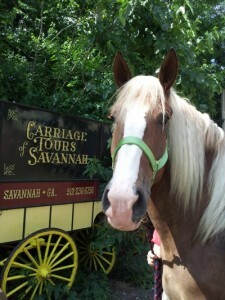 This laid-back horse has been doing tours for over 9 years. 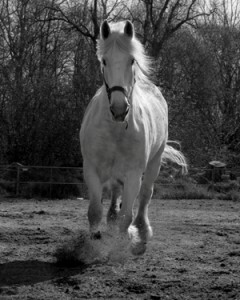 Though he is a bit gangly looking, Billy is actually from a prize-winning bloodline, and he never lets us forget it! (Height: 18 hands; Color: Brown Sorrel; Sign: Aquarius) Bob is a husky Belgian, who’s favorite game is Hide ‘n’ Seek. 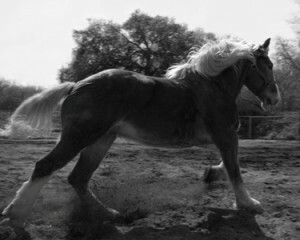 When not working, Bob likes to run in the paddock and whinny at the barn cats. His favorite music is country, in-particular BillyCurrington, having met him when CMT asked for Bob when filming a special on Billy, another Georgia boy! (Bob was star-struck, he didn’t wash his face for a week)! (Height: 16 hands; Color: Grey; Sign: Aquarius) Being an Aquarius, Charlie is very inventive. We believe he must be the reincarnation of Harry Houdini, having learned how to liberate himself and his favored co-workers from their stalls. (He also knows how to hold a grudge…he never let Pete out!) 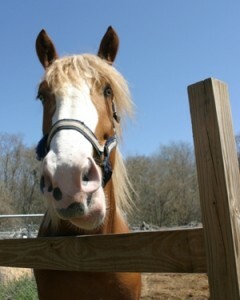 Charlie is also the first horse to know when someone walks into the barn with a bag of apples! 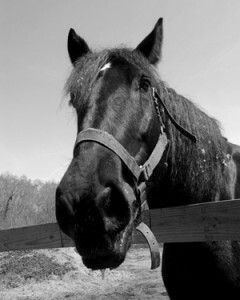 (Height: 18 hands; Breed: Percheron; Sign: Aquarius) Though he thinks he is a lap dog, Cheney is another of our registered Percherons, (a.k.a. Rolling Hills Cheney). He is very affectionate, but King tells us it’s just Cheney “kissing up” to us in order to get more play time. 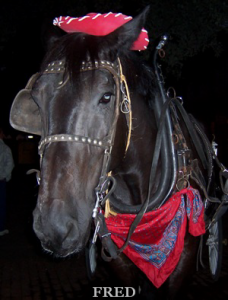 As it is, he gets plenty of play time between tours because he brings his rubber ducky to the carriage stand. Now really, how many jobs are there, where you get to take your toys to work? (Height: 16 hands; Breed: Percheron; Sign: Taurus) Bull headed Dell, likes to show who’s boss. He gets along well with Charlie as long as Charlie does his share of the pulling….which is about 10% of the time. He’s shy and reserved when it comes to strangers, so don’t take offense if he doesn’t cozy up when you meet him. Though he’s all business at work, Dell does love a good laugh and belly scratchin’. (Height: 17.2 hands; Breed: Belgian; Sign: Gemini) One of the “twins”, this eight year old has taken right to the street. Guinness got his name after being found sneaking Hops and Barley with his brother Murphy. 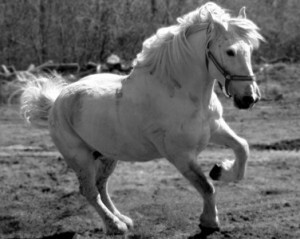 Guinness is usually very lazy, but loves to buck and roll and romp when let out to play. Guinness loves a good Irish Limerick now and again. (Height: 17.2 hands; Breed: Percheron; Sign: Sagittarius) Justice just can’t help looking and whinnying at his reflection in store windows as he passes on tour. He is also from Savannah, Ohio (see Kevin) but has an entirely different approach to his work. Justice pays little attention to the passing scenery and is content to distract himself with the carriage equipment while letting the other horse in the team make all the decisions. 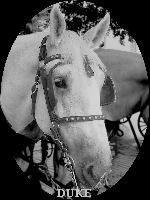 aka Kevin Starlight (Height: 17.2 hands; Breed: Percheron; Sign: Capricorn) According to his former owner, Kevin seemed destined to lead folks through a city as beautiful as Savannah. He takes his work seriously just as he did at his original home in Savannah, Ohio, (we didn’t know there was a Savannah Ohio either!) and takes pride in a job well done. This noble gentleman, was the obvious choice when we were asked to provide a carriage for the wedding of country singer Joe Nichols (see picture as featured in PEOPLE magazine) as well as the FALL 2009 Vera Bradley catalog. 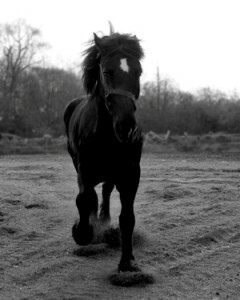 (Height 17 hands; Breed: Percheron; Sign: Pisces) King, a registered Percheron, (his registered name is Exselsior Leviticus) is enthralled by the beauty of the city. He enjoys the tours as much as our passengers. He is very observant, noticing not only the lovely squares and historic homes, but every cobblestone, crosswalk or manhole cover as he leads passengers through the streets of Savannah. (Santa may have to bring him a camera). 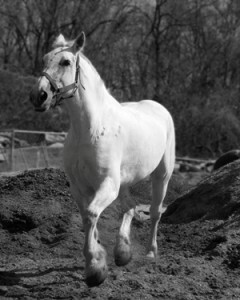 ( Height: 16 hands; Breed: Belgian; Sign: Libra) This former “Miss Georgia Equine” has no trouble getting dates, and there are plenty of options in this barn being one of only two mares! LadyBug loves to get a good pedicure (look for her “twinkle toes” when she’s working). LadyBug’s favorite movie is Hidalgo (even a horse can appreciate the looks of Viggo Mortensen)! (Height: 17.2 hands; Breed: Belgian; Sign: Gemini) The other “twin” is a bit of a narcissist, having carefully groomed that stunning bleach blonde surfer dude mane…(Murphy insists his color is all natural, however) Like his half brother Guinness, Murphy was found his muzzle deep in a bucket of Hops and Barley. (Height: 18 hands; Breed: Belgian; Sign: Leo) WATCH OUT LADIES!! This blue-eyed blonde is a “hottie”! Shea, as we call him, is out on the streets and trollin’. Shea quickly made it known that he has the drive and ambition to work his way to upper management. Despite his pretty face, he is very centered and in touch with his “inner horse.” Shea has two beautiful blue eyes, which is not often seen in a Belgian. We’re warning you! Do not look directly into his eyes…you might fall in love! UPDATE 5/2/12! Stella turned four in March and is now about 18 hands and STILL GROWING! Our debutant will be gliding down the streets entertaining all of you that visit by the end of the month! Look for her with the very handsome O’Shea….they make a STUNNING couple!